Andrew Martin inspired art students at the University of North Carolina at Greensboro (UNCG) for over thirty years. During his tenure from 1964 until 1995, Martin’s identifiable European academy style of training showed through student work. He was such a great influence, that his students referred to themselves as followers of the Greensboro School. Born in Paris and the son of a figural sculptor, Martin’s ties to art began early. His formal studies led him to The Art Institute of Chicago and the L’Ecole des Beaux Arts in Paris. Payson Park – Indiantown demonstrates Martin’s fascination with color and rhythm. 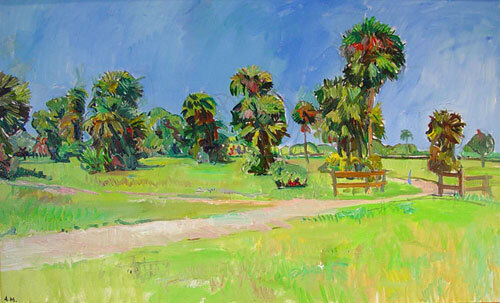 He painted this landscape while visiting former student, Bob Keeny in Indiantown, Florida. Martin gave the painting to Keeny as a remembrance of their enjoyable time painting together. Martin’s work reflects a focus on capturing the lived experience, rather than imbedding political and social symbols within. Works by Bruce Shores, Rebecca Fagg, Chris Stephens, Anne Wilkenson, Richard Fennell and Raymond Berry, are included in the Weaver Foundation Collection and represent just a few of the students Martin influenced.